"How could I honor my oath when I am fighting a war, even a good war, that the Constitution does not allow, or Congress has not approved?" Read this important article by Nika Knight, Common Dreams. Let us take this case to the Supreme Court. War is an illegal and criminal undertaking. Obama is a war criminal. Obama’s counterterrorism operation directed against Syria is in violation of international law. The evidence amply confirms that Washington is supporting the terrorists. The US Congress has endorsed a criminal undertaking. “How could I honor my oath when I am fighting a war, even a good war, that the Constitution does not allow, or Congress has not approved?” Smith wrote. The Obama administration has justified the legality of the war on ISIS by relying on the Authorization for the Use Military Force (AUMF) resolution, passed by Congress in the immediate aftermath of September 11, 2001. The single sentence, consisting of only 60 words, has now been relied upon by first President George W. Bush and now Obama to justify the unending wars waged by the U.S. in the 21st century. Those 60 words gave Bush far-reaching powers to combat forces associated with Al-Qaeda, once his administration determined the terrorist organization was responsible for the September 11 attacks. But ISIS is an enemy group of Al-Qaeda, and it remains therefore unclear to many legal observers whether the AUMF technically applies to the U.S. combat operations against that group. That has not prevented the Obama administration from pursuing and ramping upU.S. involvement in the conflict, however. 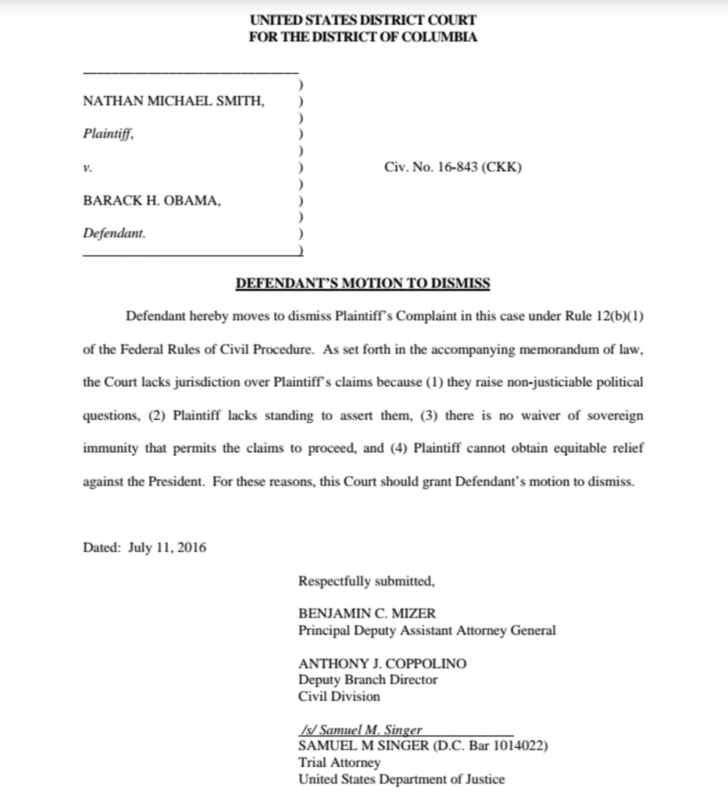 It is this authority that Smith’s lawsuit is challenging. 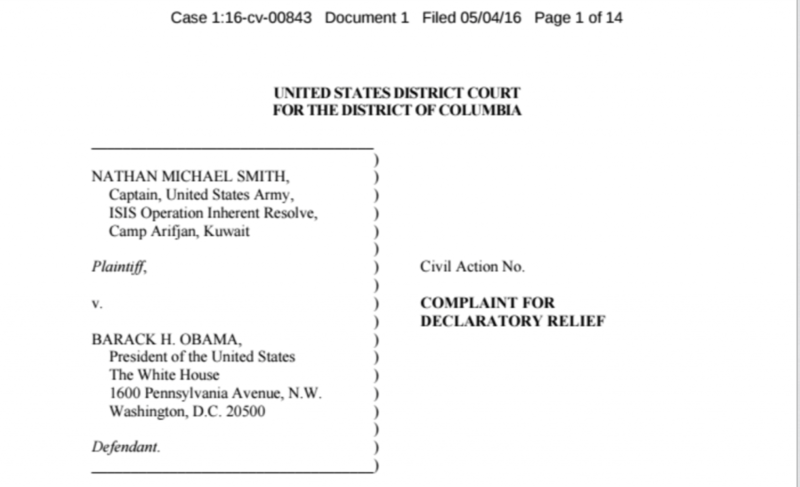 And in fact, Obama appears to have recognized—at least somewhat—the lack of clear legal authorization for the conflict, as he has requested several times that Congress issue an official declaration of war against ISIS and issue a new AUMF. Yet the White House has also argued that Congressional approval for the war is unnecessary, because the 2001 AUMF provides legal cover for it. Attempts to repeal the AUMF have failed. The President has determined that he has the authority to take military action against ISIL, and Congress has ratified that determination by appropriating billions of dollars in support of the military operation. Congress has made these funds available over the course of two budget cycles, in connection with close oversight of the operation’s progress, and with knowledge of the authority under which the operation is being conducted. The political branches have exercised their respective constitutional roles, and their joint effort in support of Operation Inherent Resolve is precisely the kind of mutual participation that courts have looked to in dismissing war powers challenges under the political question doctrine.